Facepunch have another project on the go and this one’s called Chunks. 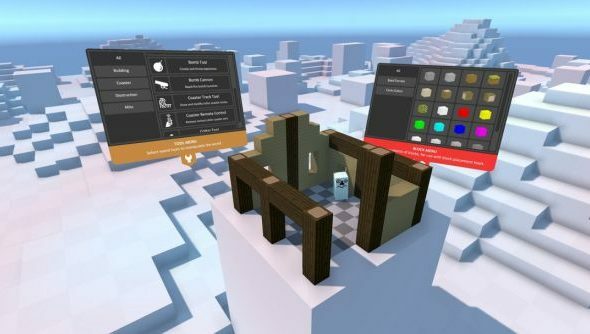 It’s a Minecraft-styled game that takes out the adventuring and peril, replacing it with more building options and the little extra detail of being a flying giant wearing a Vive headset and using touch controls to build. The gimmick is that after you’ve built your mansion, racetrack or rollercoaster in lego scale, you can miniaturise yourself and walk around inside it. If you’re sold by the aesthetic but not so much by the nature, here’s the best Minecraft seeds to keep you happy. It’s fairly rudimentary at this stage, having only launched onto Early Access today. However, the folks at Facepunch – most notably lead developer James King – have big plans for its future. Similar to Garry’s Mod, the plan is for the community to create the majority of the content for the game, including new modes of play. King plans to make this as easy as possible through a number of new systems. First, he’ll be putting together documentation on how to develop new plugins easily, so that folks can get to creating things as soon as possible. Then it’s on to more tools in-game to create assets, meaning less time spent out of VR and more creating. Then, interface improvements to make downloading and installing new ways to play easier, as well as new meta-modes to support, like local co-op with a non-VR player. More details on all this in the launch blog. Garry Newman also gives a run down in his own post. If you want to play, it’s up on Steam now at 25% off for £11.24, that launch sale going until April 18.